Be the first to share your favorite memory, photo or story of Roeun. This memorial page is dedicated for family, friends and future generations to celebrate the life of their loved one. 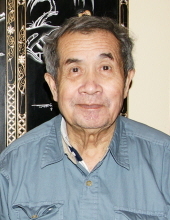 Roeun Im, age 82, of Faribault, died on Sunday, January 27, 2019 at Walker Methodist Health Care in Minneapolis, Minnesota. He is survived by his wife, Song, and five children, Lik (Narith) Nom of Shakopee, Kimseng Im of Faribault, Kimsan Im of Northfield, Danny Im of Golden Valley and Ron Im of Faribault. He was preceded in death by his parents, Him and Neang; a brother, Moeun and a sister, Ry. Funeral services will be held at the Boldt Funeral Home, Faribault on Saturday, February 2, 2019 at 3:00 p.m. with Pastor Sokheat Sous officiating. Visitation will be at the funeral home for one hour prior to the service on Saturday. "Email Address" would like to share the life celebration of Roeun Im. Click on the "link" to go to share a favorite memory or leave a condolence message for the family.